Wear and tear is a common occurrence in life. With a pressure washer, there are plenty of parts that can break down after regular use. Unlike other power tools, a pressure washer actually requires lots of replacement components in its entire life time. Other than the motor or engine, every other component has to deal with water at a high pressure. The pump, wand, hose, nozzles and washers all are put under tremendous pressure each time you switch on the pressure washer and this is why you need to regularly update your entire spray kit to prevent unwanted breakage. And then there are times when you have to repair simply because a component broke down too easily. There are two ways to maintain your pressure washer. One is to replace individual parts as and when required and the other is to buy a complete kit for replacement once any component goes bad. In my experience, purchasing an entire kit is a better option rather than replacing individual parts one by one. When you purchase an entire kit that includes a wand, hose, washers, tips, nozzles, spray gun and connectors, you are basically renewing your entire pressure washer attachment arsenal. This means that there are no more loose seals or broken connections in the pressure washer. What if you replace just the broken hose and find later on that the trigger gun gave away? All components eventually wear out evenly under pressure. Hence, the moment you are forced to change something, it is better to go with an entire kit overhaul as the other components are not that far behind from going defunct. Compatibility between individual components is also a major issue. 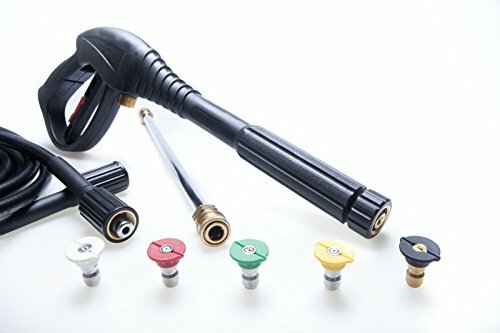 You might have purchased the right wand or connector for your pressure washer only to find that the nozzles do not sit right on it. This happens over time as kits change depending on the manufacturer and with age. You do not want to purchase a component only to later find that you need a new set of additional nozzles. Instead if you purchase an entire kit, you save money and time because everything is compatible with each other. 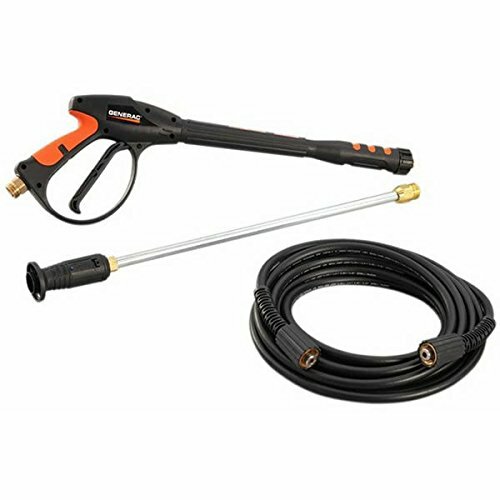 When searching for a particular kit, shop based on the pressure output and GPM of your pressure washer. For commercial grade washers, just about any average kit will do as long as it is compatible with your particular brand and make. For professional washers, you need to be careful what you purchase as inferior construction can easily damage the new kit. A pressure washer is all about pressure. So the first thing to look at is whether a spray kit can handle the pressure generated by your washer. For professional grade washers, there are many professional grade kits with lots of additional attachments, tips and connectors. For commercial grade washers with lower pressure output you could go for a variable spray head with an entire kit so as to control the pressure and flow output by simply changing the diameter of the spray head.